"It will be more uncommon to see an animal die of natural causes than it is to see an animal die of plastic." That's not a message from a possible future, but right now from someone speaking about the state of plastic pollution on our planet. Does that seem alarming? It does to me. A young Cuvier's beaked whale washed up on the shores two hours from the Philippine city of Davao. It was weak and vomiting blood. Darrell Blatchley from the Philippines' Bureau of Fisheries and Aquatic Resources received a call early Friday morning to go see the whale. A few hours later, it was dead. Why did it suddenly die? Plastic. A shitload of plastic. "It was full of plastic — nothing but nonstop plastic. It was compact to the point that its stomach was literally as hard as a baseball." "That means that this animal has been suffering not for days or weeks but for months or even a year or more." The be precise, there were 88 pounds of plastic. Most of the content came from the Philippines, specifically local grocery stores chains, chains, Gaisano Capital and Gaisano grocery outlet. Blatchley will be posting the list of items from the whale's stomach into Facebook. Hopefully this will help to shame people to care more and lead to reforms about plastic management. Plastic shouldn't end up in the ocean, and we should all use less of it. "Within the last 10 years, we have recovered 61 whales and dolphins just within the Davao Gulf. Of them, 57 have died due to man — whether they ingested plastic or fishing nets or other waste, or gotten caught in pollution — and four were pregnant." Each year, an estimated 9 million tons of plastic ends up in the ocean. More than half of it comes from five countries in East and Southeast Asia — China, Indonesia, the Philippines, Thailand and Vietnam. 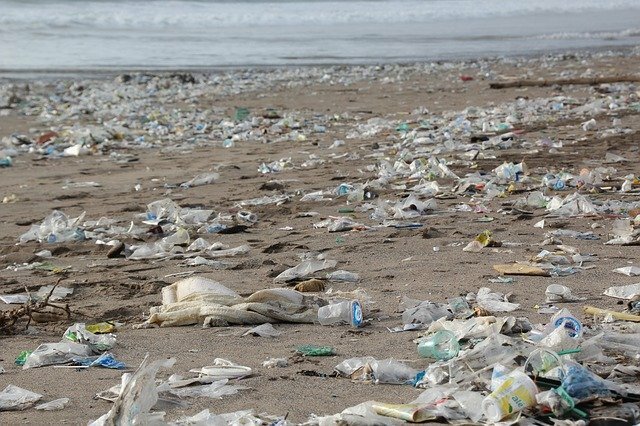 The Philippines is considered one of the "world's leading plastic polluters." Half a million tonnes of plastic waste from the Philippines ends up in the ocean each year. Blatchley is concerned that "if we keep going this way, it will be more uncommon to see an animal die of natural causes than it is to see an animal die of plastic." This is the future we humans are creating on this planet. We need to be more conscious about the consequences to our actions and change our ways. Each individual can do their part by employing more of a zero-waste lifestyle. That means to stop using plastic, stop buying plastic, and stop throwing plastic away, as much as we can. Research zero-waste practices to do your part. Greedy fiat creators, military industry and their bought for politicians. Once they saw how Germanies navy danced around the empires once unbeatable navy using oil, the system was created to use oil in as much as possible to shift the cost to as many as possible. People didn't just wake up one day and start demanding plastic be used in everything. I stopped using plastic bags years ago. I really don't see change coming until those who set up and run the businesses forcing the plastics decide to use something else. Yes, if manufactures stopped, sure it would reduce, but the buyers supply the demand. We need to stop buying, and less will be made. I totally agree with you! When are people going to take responsibility with the trash from their indulgences? Why oh why is so much on our beaches anyway? Who does that? Would you leave that on your lawn or porch forever to pile up after your party? People wake up this is what you are leaving the future generations to come. They deserve better than this and so do the creatures of our beautiful Earth, lets begin to respect where we live. Well the beaches end up full because it washes up there form the ocean :/ We and others do deserve better, and only we can make it better. I so agree each and every one of us needs to be a part of a cleaner earth. Mankind has not been that kind to the world around him. He has been selfish and placed him/herself first rather than be the servant and care taker of that which is around him. As a result animals and the natural green environment suffers. In a big way humans do too. but I am not sure that these humans are bright enough to realize it. Thanks @krnel. We are animals too, and we all suffer in the end, with plastic ending up in water and soil, absorbed by plants and we end up harming ourselves through our ignorance. Everyone can do their bit by eliminating single use plastic. But this is just isn't feasible at the moment, we are too reliant on it. The momentum is really getting going now though, so I expect that things will change soon. Yeah, buy or recuperate glass jars, store things in there. Use clothe grocery bags rather than the ones at the grocery store. Reuse and reduce, and then recycle. Very sad. I didn't know how much the Philippines was involved in this, but I could have guessed that China would have a role to play in that part of the world. It is quite disgusting to see. I try to do my little bit. Now I will try to do even more. Something has to be done about this plastic. Maybe a new form that breaks down quickly. this is so sad, I'm happy that in Europe a lot of one-use plastic has now been banned, but there is still way too much plastic and it is so harmful! And here people try to blame America! I am all for keeping plastic out of the oceans but we have to make sure that people don't use that as an excuse to do things like ban grocery bags and straws. I just posted about this today. It's very sad what's happening. Your UA account score is currently 7.378 which ranks you at #60 across all Steem accounts. In our last Algorithmic Curation Round, consisting of 377 contributions, your post is ranked at #12.